The Tennessee Overhill Heritage Series documents the turn of the century and illustrates the importance placed on heritage and historic preservation by the people of McMinn, Monroe and Polk Counties. 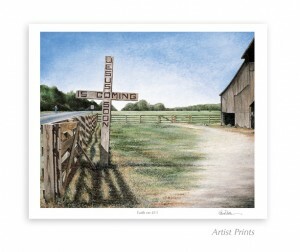 The second in Linda Miller’s Tennessee Overhill Heritage Series of limited edition lithographic prints depicts the cross erected in Polk County by Henry Harrison Mayes during the 1940’s. Linda was drawn to the cross the first time she saw it in the mid 1970’s. She recognized its value as American folk art and began asking about the history of the cross. She was inspired by the faith of Henry Harrison Mayes and the divine healing he received. The large concrete cross was located south of Benton, Tennessee on Highway 411. For half a century, highway travelers passed by this 1,400 pound Christian icon with its two-sided message. The southbound inscription warns mankind that JESUS IS COMING SOON while the other side strongly advises GET RIGHT WITH GOD. This unique piece of religious folk art is the work of Kentucky coal miner Henry Harrison Mayes. When Highway 411 was expanded to four lanes, the cross was removed. This painting is the only reminder of what stood there since the 1940’s. Mr. Mayes was born in 1898 and began his roadside mission in 1917. Feeling that his life had been spared after a mining accident, Mr. Mayes decided to serve God by sharing his prophesy with a mobile society. The small man from Kentucky used money he made as a free-lance sign painter to support his advertising crusade that resulted in crosses being erected in forty-four states. Mr. Mayes fashioned crosses by using homemade wooden molds and hand mixing and pouring concrete crosses in his backyard. After producing a substantial inventory he hoisted his artwork on his truck and set out for well traveled areas. Without permission, he would dig a hole on property near the highway and set his massive cross in place. Mr. Mayes energetic devotion is much like a 20th century Johnny Appleseed combined with the daring of a See Rock City promoter. Henry Harrison Mayes constructed and erected concrete crosses for some sixty years. Many of his original crosses no longer exist because of highway expansion programs, traffic accidents, and natural erosion. Even though this Middlesboro, Kentucky man was quiet and unassuming, his service and artwork have been reported in newspapers and featured in Newsweek, Life, and Foxfire 9. The life and work of Henry Harrison Mayes ended in 1986. Though his efforts brought about titles like “God’s Ad Man” and a “America’s Roadside Evangelist,” Mr. Mayes remained The Almighty’s humble servant all his life. The actions of Henry Harrison Mayes spoke as loud as any sermon and his life testified to the power of one person serving God. The painting is full of Christian symbolism. Click on various parts of the painting and learn about the symbols Linda Miller has incorporated into this artwork. Included with the print is the information about the cross and a sheet of the symbolism used in the artwork.